The Nora Madelyn Fund for Infant and Child Loss provides support and resources to bereaved families who have experienced pregnancy loss or the death of a child. The fund was created under the auspices of the Providence Newberg Health Foundation by bereaved parents, Jeff and Raina, after the death of their newborn daughter, Nora Madelyn, in July 2002. “Nora’s Fund is not only a way to honor our daughter’s memory, but a way to give back to the community for the kind and respectful care we received at Providence Newberg Hospital both during and after Nora’s short life,” says Nora’s parents. Nora’s Fund provides support and resources to bereaved families to assist them in dealing with the loss of a child at any age or stage of pregnancy. If your child has died, we are very sorry for your loss. We know we can’t take away your pain, but we can offer understanding, resources and referrals to support. A founding goal of the Nora Madelyn Fund for Infant and Child Loss is to provide funding for the resources and comfort items used by the Providence Newberg Hospital Birth Center staff in caring for bereaved parents. The hospital’s Perinatal Loss Committee oversees these resources. The fund also provides resources and education to medical staff and care providers who support and care for bereaved families in the hospital or clinic setting as well as in the community at large. This includes training for caregivers in pregnancy loss and the grieving process, as well as self care tools for their own issues that may arise from their work. 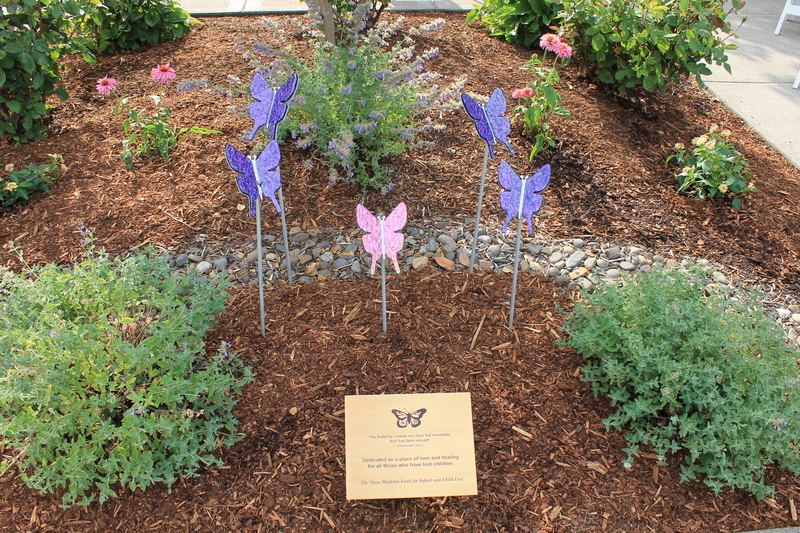 In addition, another founding goal of the Nora Madelyn Fund was to install a memorial in the Providence Newberg Medical Center’s Healing Garden, providing a place of reflection, comfort and hope for patients and families. A glass butterfly sculpture memorial was installed in the Healing Garden in spring 2006. The first annual Remembrance Ceremony for families was held in summer 2009. The ceremony and butterfly release is held each year in July. Families whose loss occurred at PNMC in the year prior are personally invited to attend; the event is also open to any family in the community who has experienced the loss of a child. To meet the needs of more families, especially those further along in their grief journey, we now hold a Remembrance Walk in October, which is Pregnancy & Infant Loss Awareness month. We appreciate your support of the Nora Madelyn Fund through a donation or participation in a fundraising event, such as the Remembrance Walk.